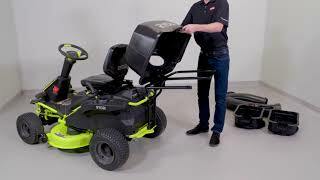 75 AH Electric Riding Mower is rated 4.7 out of 5 by 214. Rated 4 out of 5 by RJL1 from Great electric riding lawn mower Great mower. It has strong power and cuts nicely. 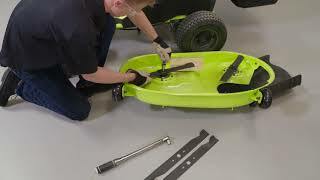 Assembly of the mower went smoothly because the instructions were clear. Operation of the mower was also easy because the instructions and the design were clear. We have a 1 acre property and the mower cuts the lawn with time left on the battery to spare. The only issue was that on the second time using the mower the front tire received a puncture from a plant shrub and the steering wheel started to squeak when turning. We were able to patch the tire with a repair kit. Maybe the tires need to be more durable, otherwise it is a great mower and we highly recommend it. Rated 5 out of 5 by happyman from Make a chore a joy I purchased this mower to reduce the time that I had to spend mowing the lawn...in a sense, buying time. I had no idea that I would have so much enjoyment using it. I hop on with my music playing on my headphones and go. The mower is quiet enough that I don't have to turn my music up too loud and it isn't invasive on everyone else in their outdoor time. The best part of this mower is that when I get off, I can literally go and do whatever else I want since I don't smell like exhaust from a small engine! And, if you are unsure of whether it can do the job or not, I assure you that this mower delivers just as great of a trim to the lawn as a gas rider. Rated 5 out of 5 by silentangel from Finally an environmental riding mower: This is an awesome mower. I love that there is no gas fumes to smell. Easy maintenance. Rated 4 out of 5 by CharlieD from No Gas, mows good I have been looking at this machine for a year. No sure about "wet cell" batteries. Not happy I had to buy it from HD. Wanted a "sales and Service" dealer. I have 2 acres just wanted this machine to mow 1 acre. Use my gas mower for the rough 2nd acre. Really believe in the battery powered yard tools. This unit runs good and mowed my 1 acre of real, some high, grass. Turns tight, maybe I need a seat belt to not fall off. Rate it a 4 because I hope Ryobi will keep improving this machine. 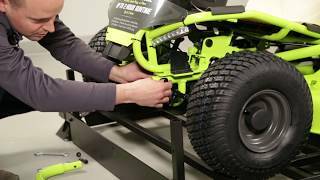 Better batteries, control panel around steering post. Some suspension. Selling at a real lawn mower "sales and Service". Rated 5 out of 5 by Greg804 from Awesome Bought this from Home Depot and it was delivered on Monday, May 8th. To my great surprise, the Home Depot had completely assembled the mower so all I had to do was connect the battery and the safety seat switch and wait for the overnight charge. Mowed today and absolutely loved everything about this mower!! Fast, clean cut. no bogging down in high slightly wet grass, tight easy turning radius for super close trimming. My wife said I am like a little kid! I am a really big gut ( 6'3" 330LBS.) and the mower didn't even hiccup with weight and the adjustable seat gave me plenty of legroom. I wonder if there is a seat with armrests or add on armrests? Because my backyard slopes so much it feels as if I might fall out of the seat!! Rated 4 out of 5 by MasonGA from Nice quiet mow I've had this mower for about a month and I have about 5 hours on it. So far it has performed very well for me. It's definitely pricey but I sure hate changing oil, so I'm happy with the purchase. I also purchased a Brinkly trailer from HD and it works great. It came in very handy after some big storms left my yard full of tree debris. I even helped my neighbors with their yards. I read a lot of reviews, watched videos and went back and forth on buying this mower over a gas rider. I don't regret the purchase. If I do run into any problems, I will try to update the review. Overall I like the mower and would recommend it. 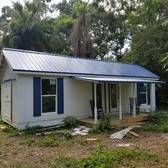 Rated 5 out of 5 by Solarhomesteader from Love this mower I have been looking for an electric riding mower and basically found only two on the market. The other brand only had an hour of cut time which really took it out of the picture since I have approximately two acres of lawn to cut. 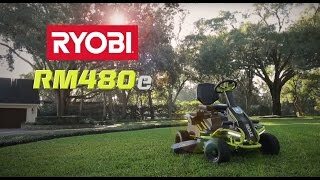 When the Ryobi RM480ex 100 AH model came out I took the chance and I am extremely happy. I can mow my entire lawn with all the hills and terrain and the battery gauge hardly moves. It cuts extremely well and does well with tall and thick grass. I have a 6.1 KW solar array on my house so this is real carbon free mowing. I actually look forward to doing my lawn. This mower is quiet, fun to ride, and easy to use. Thanks Ryobi for making this product. Rated 4 out of 5 by Mike8493 from Cool Factor 100%... Effective rider 80% I have has this rider about a month now. I have had 2 previous gas powered riders and was more than frustrated dealing with repairs and spring / fall maintenance only to have them fail mid season. I love the battery power and almost no maintenance to speak of. Extremely quiet to cut, no hearing protection needed. I have a full acre that is a rough in spots, this rider can be jarring (more than my others) but you get used to it and cut slower in the rough areas. Overall I'm very satisfied and actually look forward to cutting grass now. 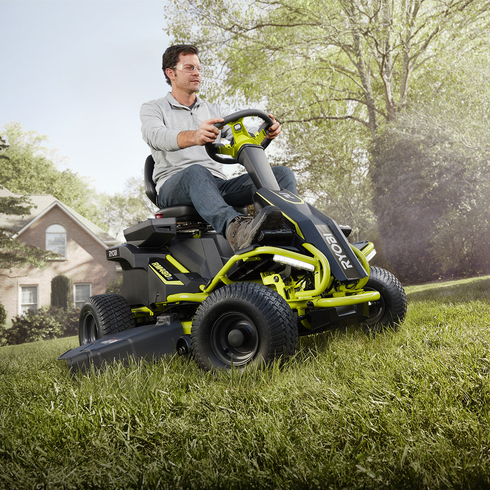 Visit the interactive landing page to learn more about this mower. Environmentally friendly. Virtually maintenance free. Super quiet. Intuitive operation. With the RM480E, you get all the benefits of owning a fully electric riding lawn mower without sacrificing power, performance or features.